SUBMIT YOUR RECIPE FOR A CHANCE TO WIN A CALIFORNIA GETAWAY! From home cook to celebrity chef! Five lucky finalists will win more than just their 15 minutes of fame with a trip for two to sunny LA where they will participate in the California Cook-Off event with celebrity chef Ben Ford. With airfare, three nights’ accommodations, a rental car and spending money included, you’ll be living your very own California dream! Don’t forget to keep coming back to www.DoleCookOff.com for more chances to enter your favorite recipes, as well as discover great new recipes to try out! And tell your friends! For each friend you tell about the DOLE Cook-Off, you’ll get an additional entry to win! DOLE was kind enough to send me a couple of free coupons for a few cans of fruit, and as a longtime fan of DOLE canned fruit, we were thrilled to receive our coupons! I love to incorporate fruit into our diets in new and interesting ways, since it seems like we're never getting enough! 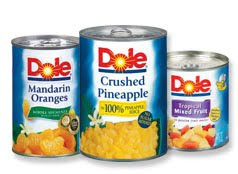 One winner will win a couple of coupons for a FREE DOLE product! To enter, tell me a recipe you could use if you were going to enter the Dole Cook-off Contest! Or, if you did enter, please share the recipe you entered with! This giveaway will end on April 23rd, 2010. Disclaimer: I was sent a couple of free DOLE product coupons to facilitate with this review. The opinions expressed above are solely my own and yours may differ. Receiving a product will NEVER influence what I write in any review. If I was going to enter, I would use my curried lentils, sweet potatoes and pineapple recipe. I make a really yummy fruit pizza that uses Dole mandarin oranges. If I entered a recipe, it would be my tropical chicken salad. SO yummy, and full of pineapples and mandarin oranges! I make a really tasty Chicken Hawaiian dish with pineapple, chicken, peppers, and some other things. Would love to try pineapple apricot chicken and many others. I don't actually COOK with fruit a lot, we just eat it alone. If I were to enter, I might do a spice cake my mom makes that has fruit in it. I would enter my recipe for fruit kabobs with yogurt dip. I would use a Watergate Salad recipe :) *Thanks* for the giveaway! I would enter my mom's chocolate pound cake recipe. I am personally a really poor baker - it's hard for me to follow directions that well.